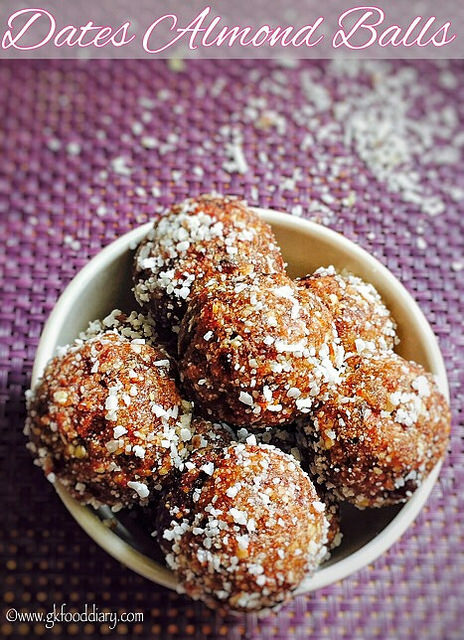 Dates Almond balls – Quick and easy energy balls made with dates and almonds. This dates almond balls are rich in nutrients and can be served as a snack in between meals to keep your kid energetic! Even its ideal for travel too. This balls have a natural sweetness from dates and chew-able, hence its ideal for babies from 10 months once the baby started chewing the food well. 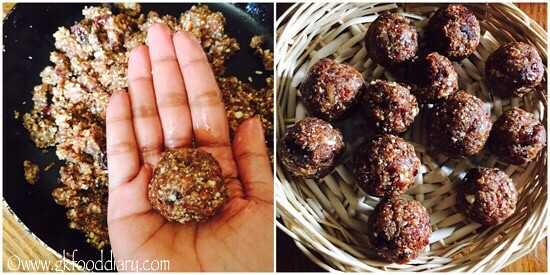 Here is how to make easy and tasty dates almond balls for babies, toddlers and kids. 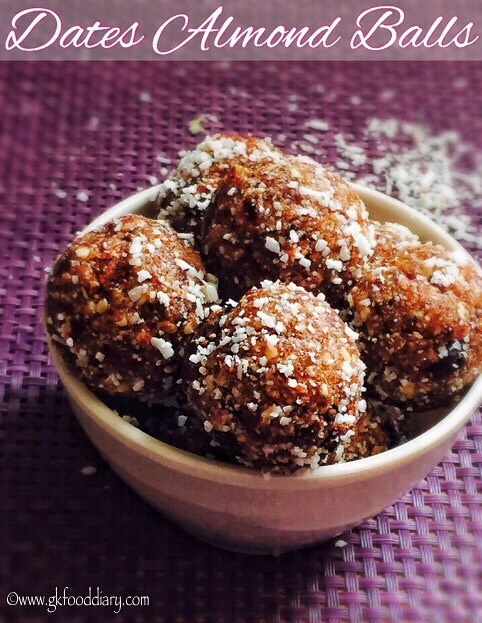 Dates Almond balls - easy and tasty balls with dates & almonds. Measure and keep all ingredients ready. Deseed and chop dates roughly. 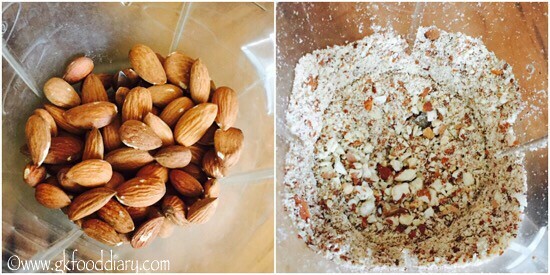 Firstly, grind the almonds in a blender along with cardamom powder to a coarse powder. 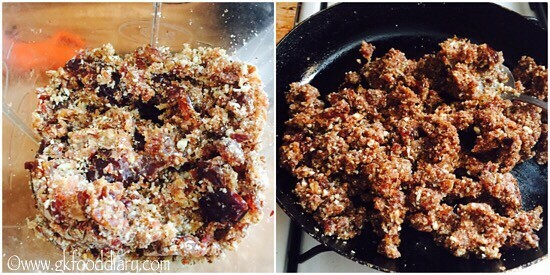 Then add chopped dates to a blender and give a run so that dates gets mixed with powdered almonds.Add a tbsp of ghee in a pan, add dates almond mix and fry it in low flame for 2-3 minutes or until the dates is soft. Switch off the flame once done and cool it down. After making balls, roll each ball in desiccated coconut if desired. This step is completely optional. 1. Measure and keep all ingredients ready. Deseed and chop dates roughly. 2. Firstly, grind the almonds in a blender along with cardamom powder to a coarse powder. 3. Then add chopped dates to a blender and give a run so that dates gets mixed with powdered almonds.Add a tbsp of ghee in a pan, add dates almond mix and fry it in low flame for 2-3 minutes or until the dates is soft. Switch off the flame once done and cool it down. 4. When the mixture is still warm, start making balls. 5. After making balls, roll each ball in desiccated coconut if desired. This step is completely optional. The tasty dates almond balls is ready! 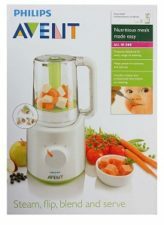 Make sure to ground the almonds finely for small babies in order to avoid choking hazard. Rolling the balls in desiccated coconut is purely optional. 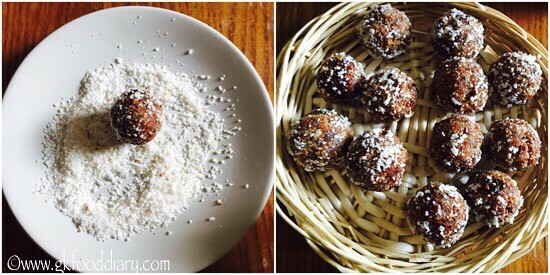 This dates almond balls tastes good even without desiccated coconut. 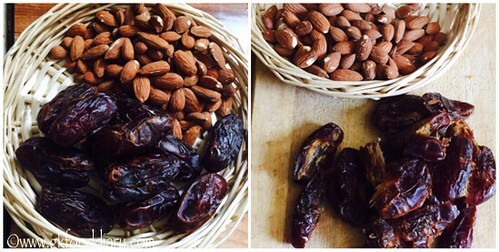 This dates almond balls stay well for 4 days at room temperature. 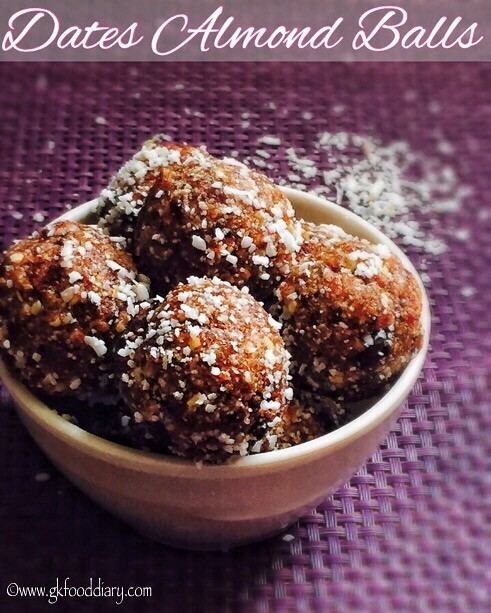 Make sure to introduce everything separate to your baby before you try this dates almond balls.